Insecticides are organized into classes—organophosphates, carbamates, pyrethroids, neonicotinoids, etc.— that share a common chemical structure and mode of action (MOA). MOA is the specific process by which an insecticide kills an insect, or inhibits its growth. Target site of action is the exact location of inhibition, such as interfering with the activity of an enzyme within a metabolic pathway. MOA and target site of action are often used interchangeably in practice and are combined as MOA in this learning module. Genetics and intensive application of insecticides are two factors of several responsible for the development of insecticide resistance. Insects with genes that confer resistance to a particular insecticide or class of insecticides survive treatment and are thereby “selected” to pass on this resistance to later generations. For a complete description of the selection process, see Understanding Resistance. Among all the different categories of pests, insects are known to exhibit resistance at alarming rates. Worldwide, more than 500 species of insects and related arthropods are resistant to insecticides. To search a registry of resistant insect pests, log onto the Arthropod Pesticide Resistance Database. 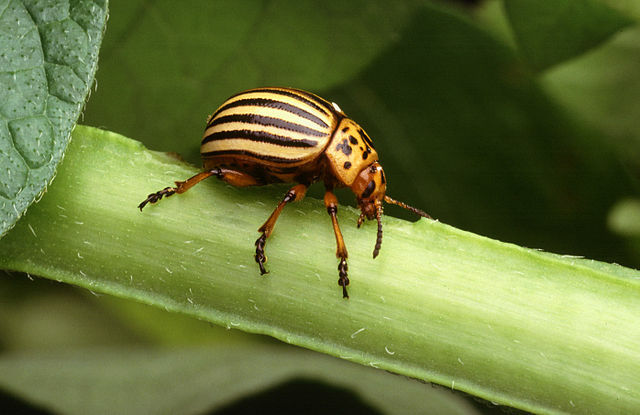 Resistance may develop to only a single insecticide. However, it is more common for insects that exhibit resistance to one insecticide to be resistant (or develop resistance more rapidly) to other insecticides with the same MOA. A classic example is the house fly. Populations of this insect that became resistant to DDT in the 1950’s, also exhibited resistance, with no previous exposure, to pyrethroid insecticides used decades later. DDT and pyrethroids have the same MOA. This phenomenon is known as cross-resistance. A closely related phenomenon, multiple resistance, occurs in insect populations that resist two or more insecticide classes with unlike modes of action. Insects develop this type of resistance by expressing multiple resistance mechanisms. This can happen if one insecticide is used until insects display a resistance and then another is used and the insect population becomes resistant to that one, and so on. Localized populations of Colorado potato beetle are notorious for multiple resistance to more than 50 insecticides with various modes of action. Multiple resistance is less common than cross resistance but is potentially of greater concern because it drastically reduces the number of insecticides that can be used to control the insect in question. In contrast to resistance, insecticide tolerance is a natural tendency and is not a result of selection pressure. Mature caterpillars are more tolerant to many insecticides than younger ones of the same species due to differences in body size, exoskeleton thickness, and the ability to metabolize a poison. These differences are identified as tolerance or natural resistance rather than true insecticide resistance. Part of the content of this module was adapted from “Insecticide Resistance: Causes and Action.” A publication developed by the Insecticide Resistance Action Committee (IRAC) in cooperation with the Southern Region Integrated Pest Management Center. Insecticide resistance is described in detail by breaking the topic into the sections listed below. All content has been expertly reviewed by Dr. Caydee Savinelli, Syngenta and Steve Toth, Center for Integrated Pest Management. Both are technical/science experts within IRAC.